How to choose the right generator ? An electric generator is an autonomous system with which you produce electricity. Its power is measured in VA (Volt Ampere), KVA (Kilo Volt Ampere), or in MVA (Mega Volt Ampere). Why should we have an electric generator? You may want to have an electric generator either to use as a permanent source of electricity, or in case you encounter electrical outages (as a backup). There is an electric generator and options for each situation. GELEC ENERGY provide diesel powered generators. Diesel generators are a versatile and cost effective way of providing backup power in case of a power outage. A train or a tram service can be disrupted from a power outage and can create problems such as financial losses and irritated customers. However with the help of diesel generators it can supply emergency power to back up the operation which is useful for any business that involves the public. Power is important to hospitals. Life support machines and basic operations must be continuous, and have a supply of continuous power, with a power outage occurs it can stall the operations. Veterinary hospitals need a continuous supply of power. Diesel generators be able to provide instant backup power in case of a power outage and can help to continue necessary operations. Datacentres need emergency backup power during a blackout because they need to continue operations and must protect electronic equipment. A diesel power backup generator automatically turns on in case of power failure and shuts off when power is restored, this is a basic need for datacentres. A power outage will prevent most retail outlets, offices and factories from functioning, having a solution in place either by having a generator installed or a service such as our Emergency Power Plan will ensure that you are backup and running quickly with minimal disruption. Automatic start your group in case of power failure, and your home will  be powered. Should I install my electric generator in a specific spot? If you are going to use an electric generator, it is because you need electricity. Therefore, you should find the appropriate place for it that will ensure proper operations and safety. It works using commonly available fuels: gas, diesel, natural gas, LPG or, for some models, biofuels. GELEC generators use Diesel. It is a light fuel and comes from oil refinement, but also vegetable oil. Like a car, the motor of an electric generator requires specific maintenance. A complete maintenance after 50 hours is indispensable, as well as a draining at least once a year. What does a GELEC electric generator consist of? An electric generator consists mainly of an industrial motor that turns at 1,500 rpm. This motor runs a generator that produces your electricity. The GELEC electric generators have motors that range from 3 to 12 in line cylinders, depending on the model, with cooling by water and direct injection. Our generators also have a DEEPSEA system for automated control and management of the Diesel generator. It also handles the functions of automatic startup/stop, measures the data and manages alarms. GELEC ensures that you have 12h operational autonomy. These reliable and robust generators are also equipped with a Leroy Somer electronic controller: These are compact, economical and efficient and result in sizable savings. – Output voltage is stabilized by an electronic system that acts on the alternator. – The rotation speed of the motor, and therefore of the alternator, also remains constant, thus ensuring the frequency of the output voltage (which is 50 Hz in Europe). The generator’s power should be in accordance with the plans and maintenance programs specified by the manufacturer of the motor, the alternator and the switching and command equipment. Our GELEC generators also have an electric startup system (with battery) based on 24V, which also permits a powerful and immediate startup. What is a triphase generator? This means that the generator has a three phase generator. The power that it delivers therefore comes from its triphase socket. This triphase generator is essential if you are powering a piece of equipment that requires 380V or more. Be careful, however, not to confuse equipment that needs triphase power, and the supply to a house in triphase. Before buying an electric generator, it is also essential to understand what power is required to operate the equipment. Nominal power corresponds to the constant power delivered when the generator set is operating. The apparent power corresponds to the power that your generator can deliver when necessary, but only during a limited period. For example: The PANTHER-25YD generator delivers a constant power of 18 kW, but it can also go as high as 24 kVA if needed. The consumption of a GELEC generator on nominal power: our generators consume between 195g/kW.h for a TIGER-280YC and 247g/kW.h for the PANTHER-25YD. The motor speed determines the frequency of the current, and the alternator determines the quality of the current. The current is corrected by the condenser or the AVR. The condenser assures good quality current. Its harmonic distortion, which represents the gap of the curve produced in comparison to that of a perfect current, is relatively strong. The AVR is an automatic electronic system that regulates the voltage depending on the charge applied in the generator. The quality of this current makes these generators compatible with most equipment. Our GELEC generators have an SX460 AVR. 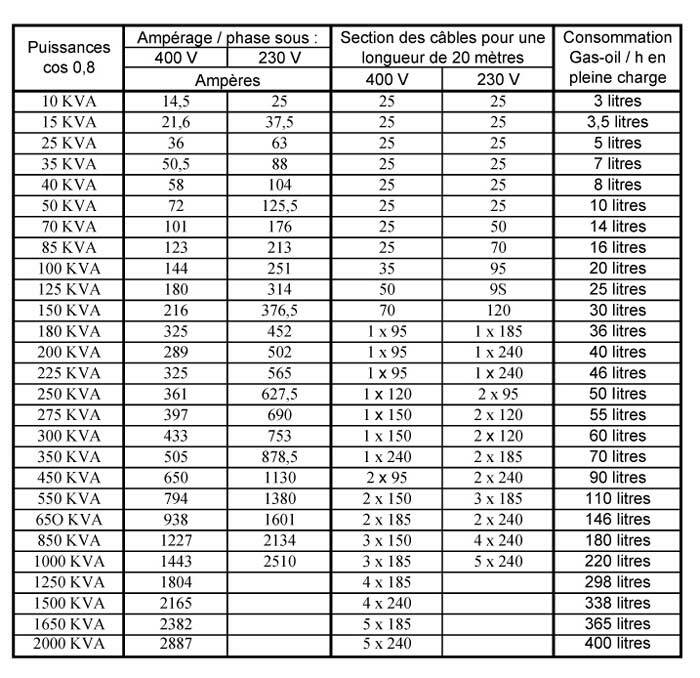 KVA / Amps /Diesel consumption of a generator.